At the age of 15 years Eleanor [Nornie] Gude was so advanced in painting she was accepted into the Ballarat Technical Art School. In 1937 she won its prestigious MacRobertson Scholarship in art, valued at £100 per annum. By that time she had progressed to the National Gallery of Victoria School (NGV), Melbourne (1936-1939) where her fellow students included Sidney Nolan, Charles Bush and Laurence Pendlebury (the latter whom she married). Nornie won numerous awards whilst studying drawing and painting at the NGV School. Although she was principally recognised for her expertise with watercolour, Nornie also received awards for her work in oils: in December 1939 she won both first and second prizes in a competition for NGV students, judged by Max Meldrum, Harold Herbert and James Quinn. She became the first woman to win the National Gallery Students Travelling Scholarship; in 1941 she won the landscape prize. Throughout the 1940s and 50s Nornie won numerous prizes for her watercolours. She was especially fond of painting children. In 1958, Nornie won the Voss Smith Prize and undertook an extensive study tour through England and Europe. She won the Robin Hood and the E.T. Cato prizes in 1959. Later awards included the Pring Prize (1970), Doug Moran Naval Prize (1988) and the Doug Moran National Portrait Prize (1990). As an artist, Nornie held no theories and was once heard to say, "You spend your first 20 years learning the technique and the next 20 years losing it." Nornie Gude is represented in the Federation University Australia Art Collection (previously known as University of Ballarat), at the National Gallery of Victoria, Art Gallery of Western Australia and Parliament House, Canberra; regional galleries at Albury, Ballarat, Bendigo, Castlemaine, Geelong, and institutional and private collections. She died at Hawthorn, Melbourne on 24 January 2002 aged 86 years. This biography written by Di Campbell, 19 October 2005. Image caption (RHS)- Nornie Gude, 1934. 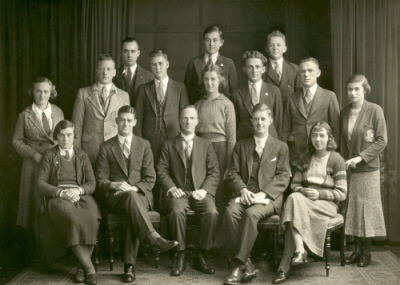 Image caption (HHS)- Ballarat school of Mines Magazine Committee, 1934. Back L-R: J. Hopwood, H. Mortimer, J. Mole. Centre L-R: J. Skelton, D. Shore, A. Collins, A. Loughton, R. Warnock, L. Bailey. Front L-R: J. Graham, M. Wilson, Dr Pound, G. Netherway, Nornie Gude.